Pedro: Me? I don't know. Stars: John Wayne, Pedro Armendariz, Harry Carey, Jr. While most remember John Ford's work with John Wayne, fewer are familiar with his early work with Harry Carey. When Carey died in 1947, Ford elected to remake their 1919 silent western Marked Men as Three Godfathers. Now starring the Duke and shot in Technicolor, this heavily sentimental allegory may serve as second-tier Ford, but it is a fun movie nonetheless. Featuring charismatic performances and a well-intentioned script, this western updating of the Three Wise Men is a fitting eulogy for Carey. 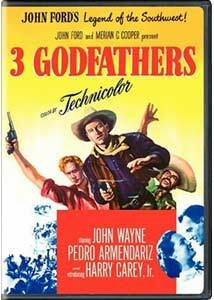 Robert (Wayne), Pedro (Pedro Armendariz), and William "The Abilene Kid" Kearney (Harry Carey, Jr.) are three bank robbers heading across Arizona. Riding through town, the trio make nice with Perley Sweet (Ward Bond) and his wife (Mae Marsh), only to learn that Perley is the town's marshal. Far from being a fool, the good marshal quickly suspects the men to be criminals. However, he finds the incriminating evidence too late and the men have already fled town with the bank's money. In the midst of the frantic escape, Perley shoots Robert's water supply and now the robbers are stuck in the middle of the desert with little chance of survival. Under Robert's experienced, astute leadership, the trio makes for the nearest water well only to find Perley's men already waiting for them. Outgunned, Robert leads them back across the desert in an effort to play the old bait-and-switch on the law's long arm. The movie starts out as the typical western adventure, with outlaws and lawmen trying to outfox each other at every turn. Laurence Stallings and Frank S. Nugent set up a fast-paced adventure, but their script takes a radical departure from its prescribed course. Stumbling upon a dying woman (Mildred Natwick) who is in labor, Pedro delivers her child. Each man is deeply touched by the bouncing baby boy and agrees to the mother's dying wish that they become his godfathers. Just as Robert is about to back out on his word, The Abilene Kid reads the mother's Bible and realizes that the ragtag criminals are being called to a new life by a higher power. It sounds cheesy and, quite frankly, it is. However, it works as a movie and provides a solid moral play about redemption. Ford's western may very well rest to heavily on its religious crutches, such as when we learn the date everything is taking place on (Surprise! Surprise! It's Christmas! ), and there are more than a few scenes that seem cheaply manipulative. Take the three men as they bicker over the baby's hygiene, discussing the importance of bathing an infant and finding him food. I really don't think outlaws in the Old West had much familiarity with baths themselves, let alone would they engage in a debate surrounding the care of an infant. However, despite these admittedly silly moments, I found myself constantly entertained. It fulfills its action quota with a rousing sandstorm sequence and Perley's relentless pursuit of the trio, while also delivering some amusing comedy. Harry Carey, Jr. does his old man proud here, giving a sincere performance as the band's naïve conscience. The Duke also is quite enjoyable, playing the rugged nature of Robert with just enough credibility to makes us believe he could truly rob a bank and still have a turn of heart when caring for a child. Armendariz is also good, relishing his role and delivering his lines with gusto. To be honest, there's nothing special about this film. It's simply a well-oiled western that the whole family can enjoy. Far from the typical Wayne/Ford pairing in terms of style and substance, the movie is still undeniably entertaining. Sometimes, that's all a film has to be. Image Transfer Review: The Technicolor cinematography really isn't all that impressive. Set mostly in the desert, there aren't a lot of colors to capture your eye. This image transfer brings the movie to DVD adequately, though there are numerous instances of print defects and mosquito noise. Detail is fine and skin tones are accurate, but nothing is noteworthy. Audio Transfer Review: The English mono mix is a faithful representation of the film's theatrical experience. Dialogue is always audible and the musical score permeates nicely, though it isn't anything striking. A French mono track is also available. Extras Review: The sole supplemental feature is the movie's theatrical trailer, which is presented in 1.33:1 and Dolby Stereo. While certainly not a classic, Three Godfathers is still an enjoyable movie. This barebones DVD certainly leaves something to be desired, but it makes a welcomed inclusion in Warner's John Wayne/John Ford Film Collection.